Apple is widely expected to launch health-monitoring software for its mobile operating system, possibly as soon as iOS 8, which should make its developer debut at WWDC this June. The software would monitor and track various aspects of a user’s health, and 9to5Mac’s Mark Gurman has a new report out today that details exactly how that might work. Using recreated screenshots based on information provided by anonymous sources, the reliable Gurman provides a glimpse at what Apple’s take on a comprehensive health tracking app looks like at its current stage of development. The software borrows cues from Apple’s current Passbook application, but with cards for different aspects of a user’s health instead of for loyalty cards, boarding passes, etc. The cards included offer records that track Activity (steps and exercise information), nutrition (presumably through a diet log, as is the case with current third-party health tracking apps), and weight, but they do further than do most existing software solutions, according to this report. In addition to those standard measurements, Healthbook also tracks Bloodwork, Heart Rate, Hydration, Blood Pressure, Respiratory Rate, Oxygen Saturation Blood Sugar and more. Activity and Weight tracking, as well as sleep and diet, work like existing solutions, as mentioned, but heart rate and blood pressure monitoring, as well as advanced measurement of blood health factors including glucose and oxygen levels would require the use of additional equipment that Apple would either have to develop itself or source from a third-party partner to make work. There’s some indication that Apple is working on pulse oximetry, which is a way to measure oxygen levels in the blood, and previous hires mean Apple could be adding a bevy of sensors to either the next iPhone, or an iPhone accessory like the rumored iWatch device. 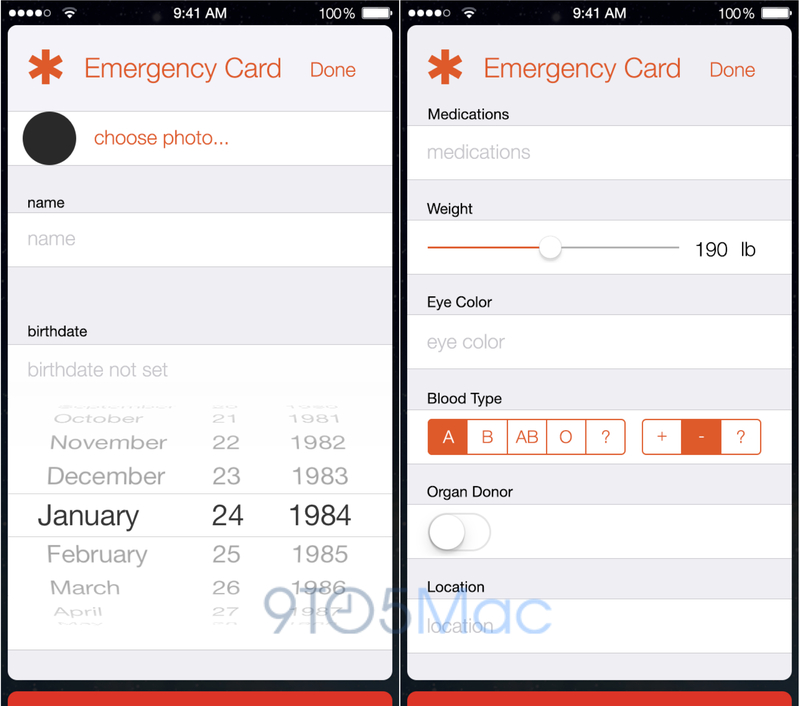 Another interesting feature detailed in the report is the so-called ‘Emergency Card,’ which provides a way for users to offer important biographical information about themselves, including a photo, their full name, birthday, mediations they’re on, weight, eye color, blood type, whether they’re an organ donor and more. This can also be set to feature emergency contact info in case of an accident, and 9to5Mac speculates that it will be made available from a device’s lock screen, just like the emergency dialer feature is now. This would make sense, given the nature of the information it contains. Healthbook still might not make an appearance in June, pending the timing of release on hardware devices that might be designed to support some of its features, the report says, but it’s also possible Apple will mostly be looking to work with third-parties to source the data used to populate the app. Whatever the case, it seems like health is definitely a direction Apple wants to go in, and the timing of when we’ll see it is likely the only thing left still to be determined.